" He'd never been an optimist. He saw the world as it was, or he tried to. That was a problem, though, when the truth he saw was so terrible. " Kaladin is tall and well-built, with a muscular body that would make it hard to believe that he was once a weedy Healer boy. His face is square, with an angular jaw and refined—if rather prominent—nose. His eyes are a dark, dark brown, difficult to tell from black, and his skin is a light tan. His hair is black, shoulder-length and wavy, though often partially tied back. He should, by rights, be considered a very attractive man, but the thick scars on his forehead and the fainter one along his right cheek rather ruin that effect. He prefers rather simple, plain clothing, wanting to make it very obvious that he is not of the Blood, or anyone else who might have any significant influence. He usually opts for neutral earth tones, rather than dark-dyed colors. Kaladin is, on first impression, a friendly if closed young man. He's eager to listen to and solve others' problems, to be a sounding board and encourage those around him. He's quick with a smile and a nod. Closer observation though will show that he's often unwilling to talk about himself, that he's slow to trust that others actually have his best interests in mind. He believes everyone is capable of betraying him, and isn't eager to give them anything to use against him when they do. He especially doesn't believe in leadership, and is certain that any of them could easily become another Evander. For all that he has little faith in others' honesty, he holds rigidly to his own. He is honorable to a fault, refusing to go back on his word again no matter how it hurts him. He's protective of his peers and those he's responsible for in some way, and is quick to jump to their defense—or help after they've been hurt—even if he honestly believes that helping them might be worse in the long run.He quickly turns to despair when things start going wrong, and is convinced that he's cursed to lose everyone he tries to protect. When he fails, he descends into a blackness that seems endless, and coming out of it can take weeks. He's loath to help those "above" him, because he doesn't consider them worthwhile, and it's only after long determination that he'll actually do anything, though he invariably will eventually do so. To an outsider, he seems fearless. Danger doesn't faze him, because he's determined that he has nothing left to lose. However, he's utterly terrified to repeat the past, and absolutely fears to lose anyone ever again. He had an anger to him too, carefully controlled, used in what he's certain will be ultimately futile attempts to actually make the world a better place. Though his parents came from a grander place, Kaladin was born at a little cothold on the periphery of Fort Hold's territory. His father was a Healer, the cothold's only Healer, and as such the family was well-respected even as most of the other holders believed they thought themselves and above others. From the beginning, he was expected to follow in his father's footsteps, become a Healer, help others. Kaladin wasn't so sure that was the only way to help, but he did it anyway. It was when he was almost eleven, when the war was nearly over, that Kaladin first knew disaster. Their cothold, miraculously spared for so much of the war, was raided. And his little brother, just a Turn younger, who idolized him for no good reason other than being his big brother, was cut down by a bronzerider right in front of him, before he could reach and shelter him. That was for no good reason either. From then on, Kaladin knew one thing to be an absolute truth: Healing could only save some. Learning to fight could protect everyone, ensuring nobody took wounds from which they couldn't be saved. Though he continued his learning from his father, and even became an official apprentice, he knew that wasn't the path he'd walk. Unfortunately, such a little cothold had no real resources for him to learn to fight. He stuck around long enough to run fifteen, at which point he ran away to Fort Hold. He presented a forged letter "from his father", giving him leave to become a guard as he had reached the age of majority. He was tall for his age, and passed easily as a young-looking boy a few Turns older. He was accepted into the ranks of the guards, and learned quickly. He took to fighting like it was what he'd always been meant to do. He was praised by his superiors. And all the while, Evander grew more paranoid, until he closed the Hold off entirely. Things went downhill quickly. Orders were crueller, and Kaladin began to doubt. Then he was ordered to obtain information at any cost from a prisoner. Finally, he refused, his conscience winning out; he was beaten and became a prisoner himself, for "attempting to undermine Evander's rule". His wounds healed slowly; a kick to the back head had sent his forehead into a wall, scraping it badly, and without proper care it grew infected. In time it healed, but not without leaving a nasty scar, one that some might even take for an attempt to cover up a Holdless man's brand. Those he'd thought would protect him—those he'd sworn to protect—had betrayed him. He regretted going back on his oath, but resolved only to make no more oaths he couldn't be certain of. And to escape. That, he longed for. His opportunity came late in the winter, when the Golden Ghost attacked and in the chaos some of the prisoners were freed. Kaladin neither knew nor cared who was meant to be freed. He fled as quickly as he could, and never again even considered returning. He couldn't go home, not after running away, so he wandered alone for a time, until he encountered a band of Holdless who took him in as one of their own. He was useful, had the skills of a Healer even if he didn't wear the knots of one, and was respected. He fought for them, helped them hunt. And then they decided that they didn't need him any more, and he was left to fend for himself. Again he was alone, and this time also lost in despair. He wandered without hope; or, rather, his greatest hope was that Thread might take him. The darkness and loneliness near consumed him, until one day he found people again. This was a Trader caravan, and though they mistrusted him, he was able to prove his skill in a fight, and was hired on to guard them. He was with them two Turns, eventually coming to believe he would stay for good. He even met a girl, Laral, and slowly the two started talking about marriage. But it seemed as though nothing were ever meant to last for him, for the wagon lost an axle, and by the time Kaladin had made it to the nearest Hold for supplies—as he could move the fastest on foot—Thread had come. He returned to nothing but metal bits of jewelry and the charred remnants of a Thread burrow that had been handled by either the Weyr or the Hold. It didn't matter. Everyone he'd cared about was gone. Again. He had no faith that things would get better, at least not permanently. They never did. Feeling half in a daze, he managed to find his way to Telgar Weyr's territory, where he stumbled upon a bluerider having a picnic, and was promptly Searched by the pair. His dour manner didn't exactly endear himself to the other Candidates though, and when Semaca was eventually mentioned as an option, well, he couldn't help but take it. Maybe things would be better there, at a Weyr where metallic riders weren't in charge, where things were different. Do you/your character have any personality preferences or concerns? : He prefers honor, and being generally good. I have no preferences here. Why do you think these choice/s would be a good fit? : To be honest, you and I both know that I'd be as amused by something that's not a good fit as I would something that actually is. Is there anything you will ABSOLUTELY NOT accept? : Ha, no. Syl is an adorable, dainty little thing. 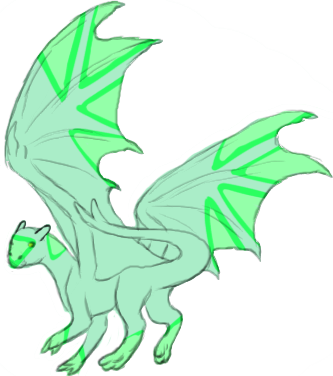 She's primarily a minty sort of spring green, but she has bright triangles on her wingsails, face, neck, and paws. Those are a brighter spring green, outlined with lime. She's quite small, even for a green, and she seems to be bafflingly quiet... Except for when she chooses to be loud, which is rather often. Syl is Trouble. She's mischievous, and enjoys playing little pranks on other fire lizards, people, and even dragons. She has a habit of stealing useful necessities like shoelaces, and hiding them in difficult-to-reach locations. She's clearly quite opinionated, and doesn't take well to being reprimanded; she's prone to going to sulk in those situations, and it's impossible to get her to listen then. She seems to think that she's more important than just a fire lizard, but she isn't bossy. She's simply self-assured.